Zimbabwe’s Starmates Maneta and Roki have been disqualified from the StarGame for contravening the Big Brother house rules. 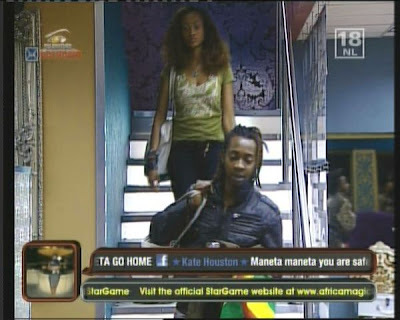 The two had a fight earlier on during which Roki poured water on Maneta’s head and she apparently poured cleaning fluid on his face thus inflicting harm on him meaning that both face the axe from the game. Biggie gathered all housemates in the lounge where he read a brief to them. He said that he had warned the two in vain, Biggie also reminded Maneta that she at one time threatened to stab fellow countryman Roki. A decision to disqualify the two Zimbabweans was reached at and Biggie announced that both had been disqualified and therefore they were to pack their bags immediately. The rules state that housemates are allowed inflict any sort of harm to themselves as well as other housemates. Housemates are also not allowed to provoke or influence fellow housemates as this leads to violence therefore a housemate will disqualified on the above grounds. This is the second disqualification in Upville, DKB and Zainab were recently disqualified after Zainab provoked DKB and the latter slapped her in the face, both have since issued apologies to their fans.